for the 7 dangerous days of the New Year holiday. Chiang Mai police, fire, and rescue personnel took part in fire and rescue training to prepare for the upcoming New Year’s holiday at the 700 Year Stadium on December 24. Rescuers attempted to extract people from a car that caught on fire in a simulated exercise. There was also a fire extinguisher demonstration and the rescue of a large number of casualties resulting from a simulated accident. The goal was to increase cooperation between the departments and ready them for the upcoming New Year holiday accident season. 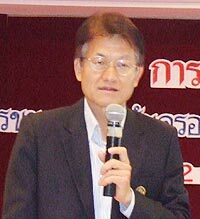 Chiang Mai’s Governor Amornpan Nimanant has requested that the relevant organizations monitor against violations of the Alcohol Beverage Control Act, install traffic cones and signs warning of the danger of road accidents at 75 dangerous spots in 24 districts, and prevent large vehicles from entering steep roads such as the road to Doi Suthep. He also suggested that out-of-towners travel with locals who are more familiar with directions if possible. 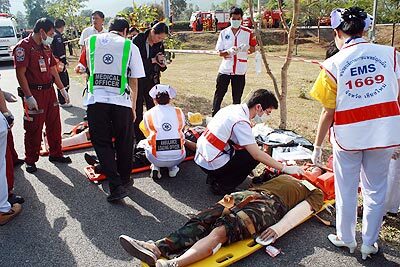 “Chiang Mai hopes to see the number of road accident decrease from last year by 5%,” Last year, over the 7 dangerous days of the New Year holidays, December 29 to Janauary 4, Chiang Mai Province had 2,375 injuries with 339 accidents daily There were 33 fatalities and traffic accidents were the principal cause of death, with 82 percent dying as a consequence. Boonlert Buranupakorn, President of Chiang Mai Administrative Organization (5th from left), Governor Amornpan Nimanant (6th from left), Chalermsak Suranan, Director of TAT Chiang Mai Office (7th from left) with the Miss Chiang Mai 2010 contestants. The annual Red Cross Fair will be the scene of the next Miss Chiang Mai contest it was announced by Amornpan Nimanant, Chiang Mai’s Governor, Boonlert Buranupakorn, President of Chiang Mai Administrative Organization, and Chalermsak Suranan, Director of Chiang Mai Office TAT on December 22. Contestants for Miss Chiang Mai 2010 will compete for 100,000 baht, a diamond crown, a trophy, a sash, and other prizes as well as to represent Chiang Mai in social events and activities held during the year. Everyone is invited to see the grand opening performance and support the beauty queens in the first round of the pageant on January 2, the second round on January 3, and the final round on January 5 at the temporary stage set up at the annual Thai Red Cross event. of the construction of new dormitories at the school. Bankadwittayakom School in Mae Wang District , Chiang Mai and Sila-laeng School in Pua District, Nan Province will be the beneficiaries of the Japanese government program Grassroots Human Security Projects Scheme (GGP) which will provide funds to build dormitories for children from outlying districts who need accommodation in order to be able to attend school. In an agreement signed by Mrs. Junko Yokota, Consul-General of Japan in Chiang Mai and Ms. Wilaiwan Phiriyakrit, Director of Bankadwittayakom School, the GGP pledged 3,322,000 baht for dormitories in Mae Wang. On the same day, Mrs. Junko and Mr. Phumiphan Prarom, Director of Sila-laeng School signed an agreement where the GGP pledged up to 3,163,000 baht for the construction project in Nan. Bankadwittayakom School, serving more than 600 students, is the only public secondary school which covers both lower- and upper-secondary education in Mae Wang District, Chiang Mai. As a result, the school accepts students from neighboring districts as well. Currently, more than 25 percent of the students stay at dormitories in or near the school. Although the school has two dormitories for female students, it has no dormitories for male students and they stay separately in small and decrepit quarters for teachers instead of students’ dormitories. Sila-laeng School provides kindergarten and primary education to 238 students from 8 villages in the Sila-laeng sub district and 6 other districts in Nan, Phayao and Chiang Rai. Many of the students are from remote hill tribe villages and about 50% of the student body requires on site housing. The school already has 6 dormitories but they are overcrowded and rundown. In response to requests from both schools, the Government of Japan and the GGP agreed to provide funds for the construction of dormitories to provide students not only with a safe and clean living environment but an appropriate learning environment as well. It is expected that the dormitories will enable easier access to secondary education for students, especially for minorities and those from low income households living in mountainous areas. Moreover, it will bring them greater options for advanced education and employment after leaving school. Fore more information regarding the GGP projects please contact Mr. Sato, Consul General or Ms. Hoshii and Mr Tsuda, GGP coordinators. 053-203-267. Mayor Preecha Worakul directs the clean up of Fa Ham. Out with the old and in with the new, as the traditional New Year’s saying goes. Fa Ham Municipality took the opportunity of welcoming in the New Year with a new start by cleaning up public spaces. About 80 officials and workers from Fa Ham Municipality spent the 4 days from December 21 trimming trees and plants, repairing advertising billboards and road lamps, and cleaning up public places like markets, temples, schools and the roads. Preecha Worakul, Mayor of Fa Ham Municipality organized the activity and said that he hoped that getting residents of Fa Ham to help in this would show them the need to take pride in the appearance of their homes and towns by keeping them clean and safe. He added that this would be a good welcome to tourists coming to Fa Ham for the New Year celebrations. Ban Phae Yan in the MaeTha district of Lamphun won the award for most outstanding Lamphun village of 2009 because the local villagers had made a concerted effort to not only keep their village safe and clean but also, by following H.M. the King’s sufficiency economy principles, was entirely debt free. 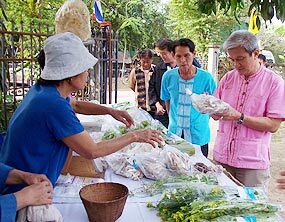 Lamphun Governor Dr. Direkkoch Panakonkleeb inspects handicrafts in the village of Ban Don Luang while members of the delegation look on. Ban Don Luang is well known for offering home stay holidays for tourists. Lamphun Governor Dr. Direkkoch Panakonkleeb was on hand to welcome Asst. Prof. Dr. Maythisa Pongsaksri, of King Prajadhipok’s Institute which conducted the survey of Lamphun to find the best villages. The Governor then went to Ban Rai Noi, in Pa Sang district, who won the award for best garbage and recycling management. Villagers instituted a Recyclable Waste Bank in honor H.M. King Bhumibol Adulyadej’s 80th birthday. Finally, the group visited the village of Ban Don Luang, to visit the handicraft center there and see the exhibition of the history of weaving. Ban Don Luang is well known for offering home stay holidays for tourists. Representatives of King Prajadhipok’s Institute collected the data on Lamphun villages in order to determine the winner of “Best Village” and plan to further analyze more villages throughout the country in order to reward successful villages with “Best Village” awards. The Prem Center Visiting Schools Program staff members from Prem Tinsulanonda International School are taking the Nongplaman village prathom school under their wing by raising funds for a two-day overnight trip to Doi Inthanon for the students. The small Thai school will be sending thirty-seven Year Six and Seven students with three of their staff on the trip in January 2010. The Visiting Schools Program (VSP) is a department within The Prem Center that hosts student groups visiting Northern Thailand. VSP facilitates outdoor education, community service, team building, and many other activities for youths aged 9 – 18 years old. International schools from countries all over the world stay on the Prem Center campus while fulfilling curriculum requirements, which increasingly include community service projects. Local Thai schools are usually open to community service projects particularly in the more rural locations. Support from international schools, through the VSP, has included building classrooms and bathroom stalls, painting village buildings, providing stationary, donating shoes and offering student scholarships. VSP has worked with public schools in Chiang Dao, Mae Hong Son, Mae Malai, Mae Rim, Mae Taeng and Samoeng. With the lack of government funding available to schools, particularly for excursions not covered by classroom activities, VSP hopes to provide Thai schools with more than just on-site projects by sponsoring annual trips for under-funded Thai schools in the community. Through fund raising, VSP staff hopes to provide Nongplaman School with an overnight trip that includes accommodation, meals, outdoor activities, science lessons and transportation. The trip to Doi Inthanon aims to expose Thai students to sites and out-of-school activities that the school administration cannot provide. Macro-invertebrate lessons and multiple site-specific studies will be provided in Thai language along with trekking and a visit to a Karen hill tribe village. The students will learn about the farming techniques adopted by the local villagers and how the ecology of the mountain has changed over time. VSP hopes to provide an invaluable experiential learning opportunity for the Nongplaman School students. The Nongplaman School fund raiser has spurred the interest of many teaching staff and parents on the Prem campus. During the annual International Day celebration held at The Prem Center, VSP raised over THB 10,000 through child sponsorship, water bottle and personalised postcard sales. In addition, many people have made private donations. VSP still needs to raise more to meet their goal of THB 75,000 for the students. To make a contribution towards the Nongplaman school’s trip to Doi Inthanon contact Michael Cumes at [email protected] or call 053 301 500 ext. 5008. Sponsorship of one student costs 1,900 baht. Likewise, if you have information about a public school that you think would benefit from a community service project, please contact VSP with more information. TAT Director Chalermsak Suranant,left, and Suranart Chaweesup, center, managing director of P.BB. Travel Agency Center Co., Ltd. Announce the new direct flights to Yangon at the Rati Lanna Riverside Spa and Resort Hotel. Myanmar owned Air Bagan announced a new service from Yangon to Chiang Mai, with the first flight taking off on January 7. The planned schedule has flights two times, on Thursday and Sunday. Chalermsak Suranant, Director of the Chiang Mai office of the Tourism Authority of Thailand, announced the planned schedule on December 18 with Suranart Chaweesup, managing director of P.BB. Travel, Air Bagan’s local representative. 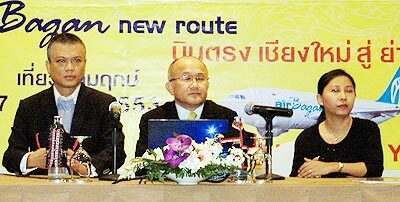 The TAT director believes that the new direct flights will make it more convenient for Thai and foreign travelers as well as business people and government officials to travel to Myanmar. He believes that the international links that Chiang Mai Airport has to offer will attract more tourists to Myanmar and the Northern region. Street vendors, home based, temporary and part time workers will now be included in the government’s social security system. Informal workers, as they are known, number as high as 24.1 million people in Thailand and, until now, have not been covered by the government social security act, Raksak Chotchaisatit, Inspector for the Social Security Office, explained at a seminar about informal workers at Lotus Pang Suan Kaew Hotel on December 22. Raksak Chotchaisatit of the Social Security office, discusses new welfare benefits for part-time and self employed workers in Thailand. Raksak explained that about 14% of the nation’s population, or about 9.2 million, is either already in the pension system or in the social security system. Enabling informal workers to join would also allow them to access benefits and the total would increase to 13 to 14 million. During 2007 – 2008, the government made some improvements on social security benefits and subsidy rates as described in Section 40 of the B.E. 2533 Social Security Act, aimed at enabling informal workers, such as home-based workers, entertainment venue workers, taxi drivers, street vendors, etc, to voluntarily obtain social security. The government also looked into allowing agriculture and fishery workers to join the social security system. Raksak further added that the government revised the Social Security Act, with approval passing in August, so that the government will partially subsidize the social security pay-in for informal workers. Raksak concluded his speech at the seminar stating, “People under the “Social Safety Net” and “Social Protection” will increase from 9 million to 24.1 million when the plan to expand social security to cover informal workers is completed. Suthep Liumsirijarern, Deputy Director of the General of the Department of Alternative Energy, joins with local officials to promote energy conservation and education in energy issues in government office buildings. A new program to promote energy savings for government offices has been launched as part of the government’s 15-year alternative energy policy which aims to increase the country’s use of alternative energy to 20% by 2022. The new program, introduced to Chiang Mai at the Lotus Pang Suan Kaew Hotel on December 22 by Suthep Liumsirijarern, Deputy Director General of Department of Alternative Energy Development and Efficiency, was developed by the Ministry of Energy to help 800 government and state enterprise offices to save energy. Five organizations, including the Energy Conservation Center of Thailand (ECCT), Arun Chaiseri Consulting Engineers with Green Earth, Kasetsart University, Energy Conservation Technology and Innovation Technology have been assigned to advise and guide the energy saving operations at these offices by providing them with specialized personnel, the development of human resources specialized in energy saving promotion, organizing activities to raise awareness in energy saving among public and state enterprise officials as well as help improve energy management of the offices. Suthep explained that the government had set new requirements for energy consumption by government offices and that some offices had been found to lack adequately trained personnel in energy savings, so that the new program was necessary to help these offices up to the legal standard set by the government. Two lovely young woman presenting autos at the Chiang Mai Motor Show. at the Chiang Mai Motor Show at the Big C Arena. Chiang Mai’s own auto show, presided over by Mayor Boonlert Booranupakorn, opened its 19th event on December 18 at the Big C Arena Hall and ended on December 27. Showcasing new cars and the latest innovations in the auto industry, the event, sponsored by V-Sign Media Company, featured test drives of the latest cars, with many local auto dealers displaying their wares. 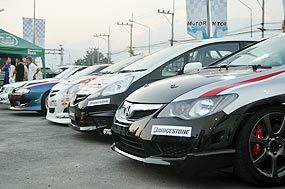 A Car stereo contest, the Off-Road King’s Cup and the Miss Chiang Mai Motor Show contest offered event goers more to do see and do than just cars. As in previous years, the lovely car show presenters were a popular attraction at the motor show. a souvenir and takes a photograph with migrant workers at the event. The North Labor Network hosted the annual event for International Migrants Day on December 18. International Migrants Day was established by the United Nations in 2000 in honor of the day in 1990 when the U.N. General Assembly adopted the International Convention on the Protection of the Rights of All Migrant Workers and Members of Their Families. The event was aimed at educating migrant workers in Thailand about their rights. Thai and migrant workers socialized, getting to know one another better so as to better improve relations between Thais and migrant workers. 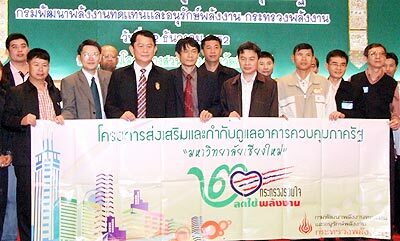 The event’s opening was presided over by Chumporn Saengmanee, Chiang Mai’s Deputy Governor. At the event, representatives of migrant workers in Thailand and the North Labor Network made 5 requests to the government: that the government monitor employers and ensure that workers in Chiang Mai receive the minimum wage of 168 baht according to the law; that the government enact laws to protect the housemaids and other personal employees; that the government allow migrant workers to obtain Workmen’s Compensation and to allow them to found labor unions or to be members of labor unions: and finally that the government operate a transparent process when doing nationality checks of migrant workers and to systematically manage migrant workers. The body of a convicted car thief was found at the side of the road in Suthep district on Wednesday, December 23. Tanawat Kaensa, 37, a Chiang Mai resident, was found with gunshot wounds to his head. A Toyota car was found nearby with the engine still running. People in the area reported to Pol. Lt. Col. Nattapong Chaichana, Inspector of Phu Ping Police Station that in the middle of the night they heard voices and the sound of an engine running followed by gunshots. Someone reported finding the body to the police in the morning. Police plan to question the owner of the Bangkok registered vehicle, Suthep Sinsawaipol, 47. Given the deceased’s criminal record, police believe that the shooting could have been the result of an illegal deal gone wrong. at the Government Savings Bank in Mae Hong Son on December 20. The Mae Sariang branch of the Government Savings Bank in Mae Hong Son caught on fire in the morning of Sunday, December 20. Local police were informed by a phone call and fire and police units were dispatched to the scene. The police officer on duty also called the Provincial Electrical Authority’s local office to have the electricity to the building shut off in case the fire was due to an electrical problem. Firefighters extinguished the second floor blaze within an hour. 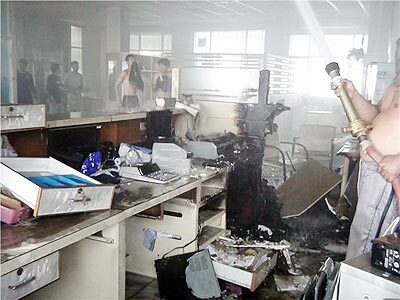 Upon entering the four story building they found that the fire had started at a computer station in the loan section. Employees of the bank told the investigating officers that it is bank policy to switch off all computers and electrical equipment before closing for the weekend. Nobody was injured in the fire as the bank was closed for the Sunday and damage costs have not yet been estimated. Police and fire officials plan to investigate to determine the cause of the fire. The body of a 6 month old male fetus was found wrapped in a plastic bag in the Mae Kha Canal in Chiang Mai’s Muang district, near a bus station on December 24. . Saokaew Yunkerd, head of the bus station, told Pol. Lt. Col. Decha Paohom, Inspector of Chang Phuak Police Station, that he had noticed the bag in the water a couple of days ago but couldn’t see what was inside due to the murky water of the canal. He said today the bag had floated higher and he could then see the fetus inside. He called over other bus drivers to confirm and then called the police. Forensic doctors from Maharaj Nakorn Hospital accompanied the police to the scene. It is believed that the body could have been aborted and thrown in the canal. Police plan to find the mother for prosecution. Acting on a tip off that local officials, together with a local wood dealer, have hired Karen from a nearby refugee camp to process illegally harvested teak, Lek Wongsa, head of the Mae Hong Son Deforestation Control Office and 50 others from the 9th Infantry Regiment Task Force, the Patrol Police Company 336 and Mae Hong Son forestry officials raided a protected area in Pang Moo in Mae Hong Son. 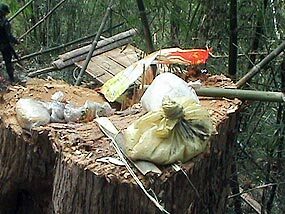 The bundled belongings of one of the workers left behind when police raided the forest area for illegal teak harvesting in Mae Hong Son's Pang Moo sub-district. 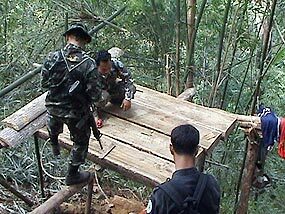 10 Karen were spotted processing illegal teak but escaped into the forest when pursued. At that site they found about 40 pieces of processed wood as well as a large number of logs waiting processing into lumber. Documents and clothing belonging to the workers that had been left behind confirmed that they were from the nearby refugee camp. Officials then searched the area and found another 100 processed teak logs awaiting transport. Mae Hong Son Deforestation Control officials have learned that trucks carrying the illegally harvested teak managed to pass through both forestry volunteer checkpoints and the police checkpoint at San Sob every day as the teak was delivered to a house in Ban Mai Nai Soi. Some of the processed teak wood found to have been illegally harvested and processed in the raid on the protected forests near Pang Moo in Mae Hong Son. Mae Hong Son Deforestation Control officials speculated that the gang in charge of illegally harvesting teak had moved to Pang Moo after their operations near Nam Piang Din village had been shut down. The illegally harvesting of teak has been ongoing in the area for at least three months. Trails leading to the nearby refugee camp indicate that wood was taken there after processing. The officials plan to request a search warrant for the refugee camp from Prasert Osatapan, District Chief Officer of Mae Hong Son Muang District.. The District Office has previously refused entry to the camp by the police searching for stolen motorcycles. The motorcycle thief told the police that he had sold many motorcycles to the camp but the District Office refused to issue a search warrant for fear of causing unrest among the refugees. Deforestation Control officials state that if they cannot get a warrant from the District Office they will request one from the Ministry of the Interior.